DONALD J. TRUMP is Chairman & President of The Trump Organization and Chairman of Trump University. The world's most famous real estate investor and a bestselling author, he is the archetypal businessman, a dealmaker without peer, and an ardent philanthropist. He has continually set new standards of excellence while expanding his interests in real estate, world-class hotels, gaming, sports, and entertainment. 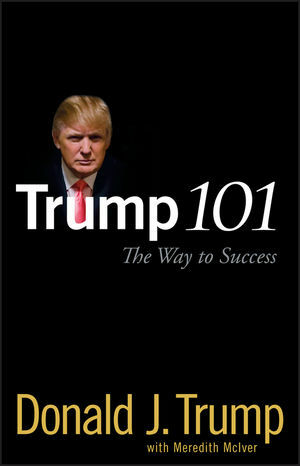 Foreword by Michael Sexton, President, Trump University. Chapter 1. Don't Waste Your Life On Work You Don't Love: Passion Will Help You Do Better. Chapter 2. Set the Bar High: Make People OoH and Aah. Chapter 3. Think Trump Scale: Bigger Is Better. Chapter 4. Tough It Out: Be Persistent. A Very Special Week (Plus) in My Life (Monday). Chapter 5. Without Knowledge, You Don't Stand a Chance: Gain and Use Information to Your Advantage. Chapter 6. You're Fired! Words No One Wants To Hear-Or Say. Chapter 7. The Proof Is In the Doing: Learn By Doing and Taking Risks. Chapter 8. Your Gut Is Your Best Advisor: Listen to Your Instincts. A Very Special Week (Plus) In My Life (Tuesday). Chapter 9. Personalize Your Pitch: Know Who you're Addressing. Chapter 10. Surround Yourself with beauty: Enhance Every Aspect of Your Life. Chapter 11. Negotiate to Win: Use Diplomacy. Chapter 12. Think on Your Feet: It's The Fast Track to Success. A Very Special Week (Plus) In My Life (Wednesday). Chapter 13. Work with People You Like: It Sure beats Working with Enemies. Chapter 14. Where There's A Will, There's a Win: Think Positively. Chapter 15. Swim Against the Tides: the Comfort Zone Can Pull You Under. Chapter 16. Money Is Not Always the Bottom Line: It can be A Scorecard, Not the Final Score. A Very Special Week (Plus) In My Life (Thursday). Chapter 17. Learning Is Exciting: Each New Project Is An Adventure. Chapter 18. See the Whole Picture: Put Be Prepared for the Picture to Change. Chapter 19. Wait for the Right Pitch: Business Success Is All About Patience and Timing. Chapter 20. Avoid Fixed Patterns: Be Open and Flexible. A Very Special Week (Plus) In My Life (Friday). Chapter 21. Speed Kills-The Competition: get Right to the Point. Chapter 22. Do More-Always Do More: Constantly Try to Top Yourself. Chapter 23. Leaders St the Pace: Fin Your Working Tempo. Chapter 24. Results Matter More Than Routes: Let People Follow Their Own Paths. A very Special Week (Plus) In My Life (Saturday/Sunday). Chapter 25. Approach your Work As An Art Form: Work Brilliantly. Chapter 26. Keep Your Mind In the Game: Pay Attention and Stay Focused. Chapter 27. It Takes Courage to Persist: business Pressures Never Stop. Chapter 28. Join the Explorers' Club: Learn About the Mysteries of Life. A Very Special Week (Plus) In My Life: A New Baby! (Monday/Tuesday/Wednesday). Chapter 29. Confidence Is a Magnet: It Will Draw People to You. Chapter 30. Keep Your Momentum Rolling: But Never Lose control. Chapter 31. Is the Problem a blip or A Catastrophe? Expect Problems and Keep Moving Forward. Chapter 32. Reach Within to Rise Above: But Temper Your reach with Reality. Chapter 33. Concentrate on the Target, Not on the Weapon: Focus on What Matters Most. Appendix A: The Trump Organization At A Glance. Appendix B: The Trump Store.